I awaken in the morning to birdsong outside my window. Drawing back the curtains, I see blue sky, with a hint of frost in the deep angles on the roofs of my neighbours. Clear, cold skies overnight signify a warmer day ahead. After morning church, we head downtown. First, to buy a new waterproof jacket for me, then to Fisherman's Wharf for our first al fresco meal of the year - fish tacos eaten in the sunshine while watching sailboat masts sway at their slips. After lunch we walk along the Inner Harbour. A heron, framed by reflections from a kayak on a float house, slowly turns his head back and forth. The new Johnson Street bridge is in place and in use. The old blue bridge is partially dismantled and the remainder will disappear in a few weeks. I am not fond of the new bridge, but perhaps it will grow on me. We wander by the Legislature, and I admire the copper domes against the blue sky. 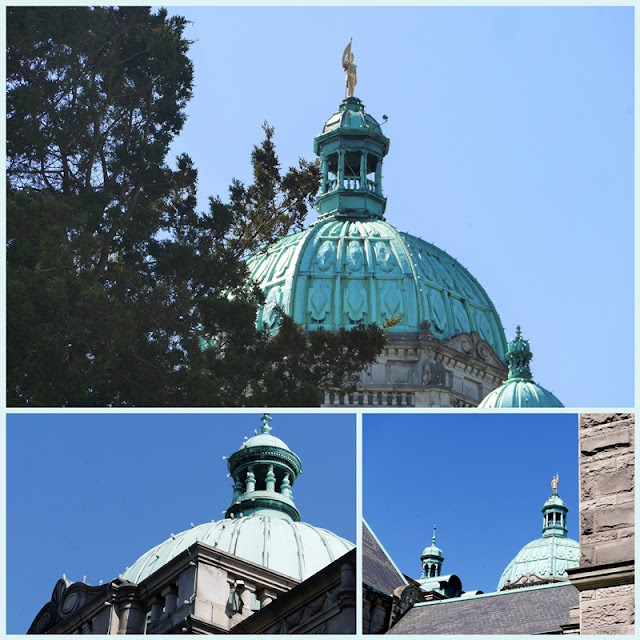 The golden figure of Captain George Vancouver, a British naval officer who charted many of the waters around the islands in the late 18th century, tops the main dome. In the gardens around the government buildings, the blowsy tulips are almost finished, but still so pretty. We walk back to our car under arches of ruffled pink petals. Hundreds of these trees grow downtown to be admired by locals and tourists alike. Home again, I am replete with sunshine. Such a beautiful day. Thank you for your kind comments on my last post. Yes, blue days come and we get through them. I'm glad that I finished my latest batch of report cards, and spent some time with friends, and walked in the sunshine this weekend. Linking with Maggie of Normandy Life for Mosaic Monday. Such a lovely way to spend the day, the photo of the heron is stunning and could grace the pages of any top flight lifestyle or travel magazine. Wishing you blue skies and sunshine for the week ahead. Isn't spring the most beautiful time of year? Those pink flowering trees are glorious! enjoy! and have a wonderful week. Your descriptions are so enjoyable to read. The words paint a picture as well as the photographs, though that photo of the heron in the water—marvelous! The bridge does look modern and out of place. Vivid white is a striking choice. Hopefully, it’ll settle in and become part of the fabric of Victoria and you will all love it one day. Such a beautiful spring day! My daughter and I walked the Sun Run in Vancouver. The weather is glorious. Lorrie, Love those arches with the pink blossoms. It was a wonderful day with good variety of activities. Thanks for sharing and have a great day. Sylvia D.
A beautiful post....love the frothy pink blossoms...and hope you found a great jacket! I did. One that will keep me dry on the boat and elsewhere, and with a bit of shaping that looks good. Win, win. Sorry I have just realised that I got your blue day completely wrong - forgive me, but there is no mistaking that the above is definitely a pink day filled with clouds of blossom. It was a truly lovely day. Oh my! So many beautiful photos in this post. I love the bright green reflection with the heron. And the flowers draping across the sidewalk and that old red brick building. Makes you happy to be alive, doesn't it? Hugs! Yes, the world is a beautiful place in spite of all the horrors that happen. Those cherry blossoms! I am in awe. And homesick for the PNW ... and for Spring!! What a perfect day. This was a lovely post from beginning to end! Wonderful photographs, Spring has sprung ... that blossom is heavenly. The blossoms are amazing! What a lovely day in your part of the world. You live in such beautiful surroundings! 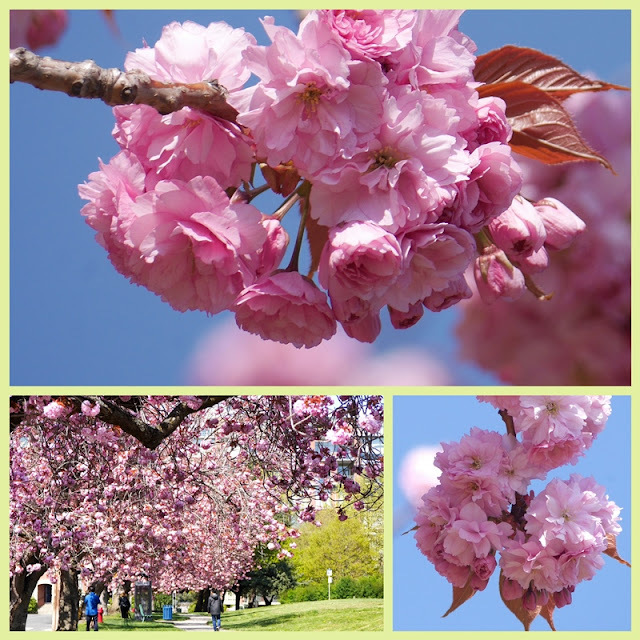 Those blossoming trees with the pink petals are just so beautiful!! The season is always too short! It's a wonder those magnificent cherry blossom trees are still standing under the weight of their blooms! They are wonderful. The floral images are spectacular! Such a lovely Spring Sunday and you filled it with good things. I would love a fish taco right now! Hope your week is progressing well. YES! This is the sort of day that says 'all is right with the world'. As many above have said, the heron picture is a million-dollar composition! And I think the light on the tulips makes it a close second!!! Hoping the rest of your week is just as sunny and 'pink'! Oh, so pretty! Love the cherry tree blossoms and the blue, blue skies. Sometimes; when I see these marvelous scenery (ones we Japanese can't enjoy), I feel benefited through blog. Hi Lorrie! I especially loved the framed heron photo, the tulips, and the cherry blossoms. I also read your previous post, and yes, I do get blue from a certain situation in my life, but I have chosen happiness, and must write down something joyful or that I'm thankful for, each day, in my journal. It helps me! What beautiful blossoms! Great post. Lorrie, what a beautiful day out you had! I especially like the photo of the heron -- outstanding! It was a lovely week,wasn't it? I hope this weekend rain goes away soon - we've had well over an inch since last evening - I'm ready for more sunshine. Your spring photos are fabulous!!! !